James Muhammad helps Lakeshore Public Media cut debt, add programming. 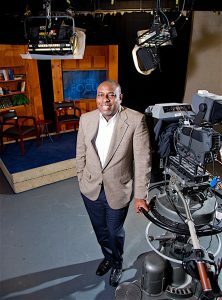 James A. Muhammad, president and CEO of Lakeshore Public Media (LPM), grew up in Tuscaloosa, Ala. He went to Stillman College on a choral music scholarship and traveled the country performing with the college choir, but majored in communications. By association, Muhammad was an early consumer and fan who dreamed of a career in broadcasting. president and CEO in 2013. During his junior year at Stillman he had an internship at the Center for Public Broadcasting at the University of Alabama and that was the start of a decades-long career in public media. He later moved to Peoria, Ill., where he served as program director for the public station at Bradley University. His reputation began to spread within the industry, and he was recruited for director of radio services by West Virginia Public Broadcasting (WVPB). Muhammad worked at WVPB for 13 years and says, “I had the privilege of learning from some extraordinary individuals like Trey Kay, producer of a documentary called, “The Great Textbook War.” It addressed the violent protests that broke out when civil rights activists and teachers pushed to include books like “The Autobiography of Malcolm X” and “Soul on Ice” in school curriculums.” The documentary won a Peabody Award and during Muhammad’s tenure WVPB programs won other prestigious awards like the Albert I. du Pont Silver Baton, Gabriel Award, and the Edward R. Murrow Award. Muhammad’s star was rising and he was on the radar of public media stations across the country. In 2013 he joined LPM as president and CEO. The mission of LPM is to provide listeners and viewers with the latest local news, sports, weather, and information on local cultural and community events. When he arrived, the station had significant debt, so one of his first priorities was to reduce that debt. Under Muhammad’s leadership the station’s debt has been reduced and LPM has increased its television and radio programming, significantly broadening local news coverage on 89.1 FM. The station launched “Counterpoint,” with Garrard McClendon, which helps to connect residents of Northwest Indiana with Chicago. LPM also re-launched “Regionally Speaking,” a daily one-hour program that presents stimulating conversations with local thought leaders. These and other programs have been well received.